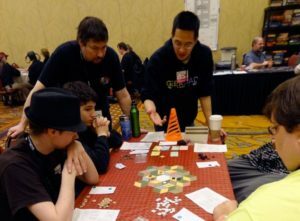 Game Masters are at the heart of GameStorm. Running a game or two is a great way to become more involved in the GameStorm community, and it has perks (keep reading to learn more)! Game submissions for GameStorm 21 will close at 11:59 PM on Friday, February 15th, so get your events in now! All that’s required to run a game is that you be familiar enough with it to teach it (though you can request that players know the game before signing up). Most GMs run games that they own, but if you’d like to borrow a game from the game library to run, you can note that in your submission. To submit a game, go to the event submission page and fill out the form. You’ll need a login account on this website before you’ll be able to submit an event. The main website and the scheduling system share login accounts. You can submit an event before obtaining a membership, but we will contact you before pre-registration closes on March 8 if you haven’t obtained one. If you don’t have a membership by then, your events may be canceled. Set the player max to the total number of players you want. If your game accommodates up to 5 players but you want to limit it to 4, make the player max 4. The player max should include you if you are planning to play. If you want to be one of those players, check the “GM is player” box. Be sure to let us know in the Notes field when you want the game to be scheduled. Events may have more than one GM, or they may be associated with multiple tracks. To request such exceptions, please mention them in the Notes field. You’ll be able to edit your event only until it’s tagged as proofread or accepted by a scheduler. After that you’ll need to email any changes to us. We strongly encourage anyone who is planning to run a game to subscribe to the GM Announcements list. Now, about those perks we mentioned: Every hour of gaming that you run will earn you a “GameStorm Buck” redeemable for fabulous swag, much of it contributed by game companies. RPGs get an extra buck per event in recognition of the prep required. If you run at least 12 hours of pre-scheduled events, you’ll be eligible for a guest membership to GameStorm 22 in 2020. If you have questions or issues related to the website, please use our contact form contact the webmaster. For event-related questions, contact events.